The action forms part of a strategy to counteract the designs of the union bureaucracy to distance its membership from the current revolt, and protest its management and mediation of workers' struggles in Greece. The occupants aim to create a space in which to facilitate a grassroots and self organised workers response to the crisis, and bring the wider working class into the events unfolding on the streets of Greece. 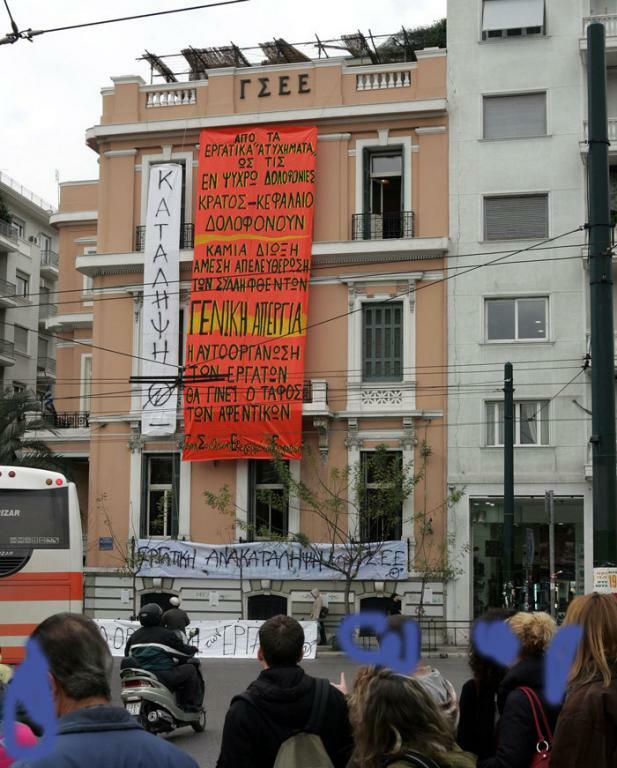 Town halls in Athens and Thessaloniki have also been occupied in order to hold general assemblies. -To turn it into a space of free expression and a meeting point of workers. -To disperse the media-touted myth that the workers were and are absent from the clashes, and that the rage of these days was an affair of some 500 "mask-bearers", "hooligans" or some other fairy tale, while on the tv-screens the workers were presented as victims of the clash, while the capitalist crisis in Greece and Worldwide leads to countless layoffs that the media and their managers deal as a "natural phenomenon". -To flay and uncover the role of the trade union bureaucracy in the undermining of the insurrection -and not only there. GSEE and the entire trade union mechanism that supports it for decades and decades, undermine the struggles, bargain our labor power for crumblings, perpetuate the system of exploitation and wage slavery. The stance of GSEE last Wednesday is quite telling: GSEE cancelled the programmed strikers' demonstration, stopping short at the organization of a brief gathering in Syntagma Sq., making simultaneously sure that the people will be dispersed in a hurry from the Square, fearing that they might get infected by the virus of insurrection. -To open up this space for the first time -as a continuation of the social opening created by the insurrection itself-, a space that has been built by our contributions, a space from which we were excluded. For all these years we trusted our fate on saviours of every kind, and we end up losing our dignity. As workers we have to start assuming our responsibilities, and to stop assigning our hopes to wise leaders or "able" representatives. We have to acquire a voice of our own, to meet up, to talk, to decide, and to act. Against the generalized attack we endure. The creation of collective "grassroot" resistances is the only way. -To propagate the idea of self-organization and solidarity in working places, struggle committees and collective grassroot procedures, abolishing the bureaucrat trade unionists. 17:50 50 bureaucrats came along to the building of the insurgent workers. They came together with some “heavies” but disappeared in the sight of anarchist reinforcements from the Economics university, chanting slogans of solidarity. An offhand answer to "mr." Panagopoulos regarding his statements on NET channel. "Mister" Panagopoulos stated on the state channel (NET), that "some youngsters occupied the building of GSEE (...) if they were manual workers, they'd be on building sites now (...)". This unearthy subject, belonging to the managerial staff of National Bank of Greece,that "represents" the workers, where is he himself now, and what does he know about building sites? He has been a technocrat for his entire life, a manager in State Companies (DEKO), a party wangler and a gravedigger of struggles. This spokesman of PASOK politics within the workers' movement lives in the northern suburbs, smokes cigars and gets a fat paycheck, from National Bank and GSEE, while administering huge state and europe-union funds. He got promoted from his boss, while it is forbidden for trade unionists to get a promotion during their service time - and he accepted the promotion. He organized a conference for the 90 years of GSEE in the amphitheater of National Bank, namely the amphitheater of his boss mr. Arapoglou, with funds of the Foreign Office, thus showing his intentions and his class position. Panagopoulos can go join his bosses, just as he does every day. Just as he signs the collective agreement with the employers, giving us the lower wages in Europe. How dare he reproach the insurgent workers, he who is the ringleader of repressing every labor demand? Here in the occupied GSEE, there is plaque that commemorates each of its leaders. Above the name of Panagopoulos, there are many other names of bureaucrats who got the reward of becoming PMs: Kanellopoulos, Protopapas, Polizogopoulos. On this plaque there are also the names of the appointed (not elected) professional unionists during Junta and the Occupation. That's where Panagopoulos' name deserves to be. If Panagopoulos has worries about those who now are at work, let him stay calm. They will turn up for the evening assembly, that will open up the building he kept closed during all these years. They will not go to work tomorrow -the day he refused to call for a strike-, to hit the streets and express their rage. Panagopoulos declared this morning that we are not workers, since workers are at work. This, among many other things, reveals what Panagopoulos' "job" really is. Panagopoulos' "job" is to make sure that workers are at work, to do everything within his reach to secure that workers are at work. But for the last ten days, workers are not only at work, they are out on the streets. And this is a fact that Panagopoulos and every Panagopoulos can't hide, even if he succeeds in hiding the sun that brings light to our steps and rage onto the streets of this city. We are working people, we are jobless (paying in layoffs our participations in strikes called by GSEE, when they -the trade unionists- are rewarded with promotions), we are working under contract moving from job to job, we work insecured formally or informaly in "stage" progams or in subsidied jobs to lower the unemployment indices. We are part of this world and we are here. Whoever wants to understand can understand. We are insurgent workers, end of story. Every single one of our revenue stamps is paid with blood, sweat, violence, broken waists, broken hands, knees, feet, heads. The entire world is made by us, the workers. They are so ambitious! So inspiring... what can Americans do to help? i'm sending you revolutionary greetings from Czech Republic. We, class militants, are exited to see how's class struggle developing in Greece nowadays. Capital has entered in phase where its contradictions becomes more visible, it produces proletarian resistance and time to think about perspectives of proletarian lives. More class brothers and sisters discover that Capital has nothing more to offer, just misery and war. There are almost no new territories/market places where Capital can try to solve its crisis. Capitalist 'paradise' disappears and proletarian revolution becomes visible as only real solution how to save our lives, nature and mankind in general. Class gets organized and produces in this struggle its revolutionary party. Recent call for solidarity from Greece shows that communist program is more visible in struggle of Greek proletarians, nobody can label this struggle as some 'nihil' or 'hooligans' street-fights! Greece, China, Haiti, recent French riots shows that class struggle becomes more violent and radical. Proletarians get organized! It's time to get prepared! We greet you and support your protest movement against capitalist exploitation, the capitalist state which provides the suitable conditions for this exploitation and against the trade union leaders whose policies of class concession undermine workers’ interests. Worker-communism Unity Party and Worker-communist movement has always defended workers’ direct action and active involvement in decision making Worker-communist movement in Iran under the leadership of Mansoor Hekmat has for two decades called for the formation of workers’ general assembly in work places. Regular general assemblies are the only way of safeguarding workers’ direct action for their interests. Hence the formation of your general assembly at the trade union centre is a very radical and important action. It is vital to turn this general assembly movement into a consistent and regular tradition in all places of work in Greece. The formation of workers’ councils on the basis of regular general assemblies is the best and easiest tool for workers’ direct action. They also guarantee the involvement of masses of workers in determining their own fate. We are aware that trade unions are obstacles in direct workers’ actions. Furthermore, trade unionism propagates a class compromising policy with capital and capitalists. To achieve its goals and revolutionary perspective, the communist proletariat has no choice but to settle accounts with trade unionism. This is an indisputable reality of revolutionary and communist struggle against capital and capitalism. However, we must not forget that until the emergence of a real radical organizing alternative, we must not call for abolishing trade unions. In the absence of mass workers’ organizations that are run on the basis of workers general assemblies, the abolition of trade unions will result in even harder situation and open the door for more aggressive attacks by the bourgeoisie and its government on workers’ rights and living conditions. The compromising nature and role of trade unionism, especially in the present harsh days, are becoming clearer. At a time when capitalist crisis is causing millions to be unemployed, and one billion people to go hungry, at a time when capitalist governments are busy bailing out the capitalists using huge amounts of money from workers’ pockets, we are witnessing our class brothers and sisters losing their houses and livelihoods. We have to expose them. We have to extend our efforts to build our Party organization too. The formation of Worker-communist parties is one of our most urgent tasks. Without such a party, workers’ struggle will not achieve its final goal. Ceasing political power from the bourgeoisie and establishing workers’ state needs a Worker-communist party at the forefront of workers’ and people’s struggles. The deep capitalist economic crisis has imposed harsh conditions on millions. At the same time, this could be our chance to destroy capitalist system and put an end to the misery of wage slavery. Your profound sentence demonstrates this fact all too well: “We will either determine our history ourselves or let it be determined without us”. There is no time to waste. We have to organize workers and keep the working class united. We must form mass workers’ organizations and turn general assemblies into a regular and sustainable tradition. At the same time, communist workers must build their Worker-communist party. To abolish capitalist system, wage labour, private property on means of production and distribution; and to establish socialism, workers need a revolutionary Worker-communist political party. Thanks to 30 years of radical and revolutionary struggle your comrades within the worker-communist movement in Iran have gained massive theoretical, political and method of work. We must make these experiences available to the international working class and bring down the bourgeoisie in an act of massive, international and class solidarity. Worker-communism Unity Party and the working class in Iran are with you in this vital and determining battle. it still makes the hair on my back stand up when i read it.